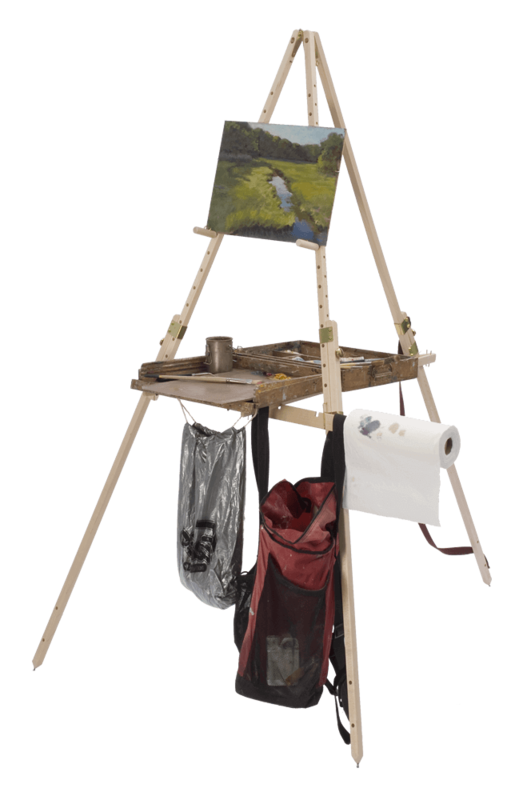 Take It Easel The only plein air easel you need. 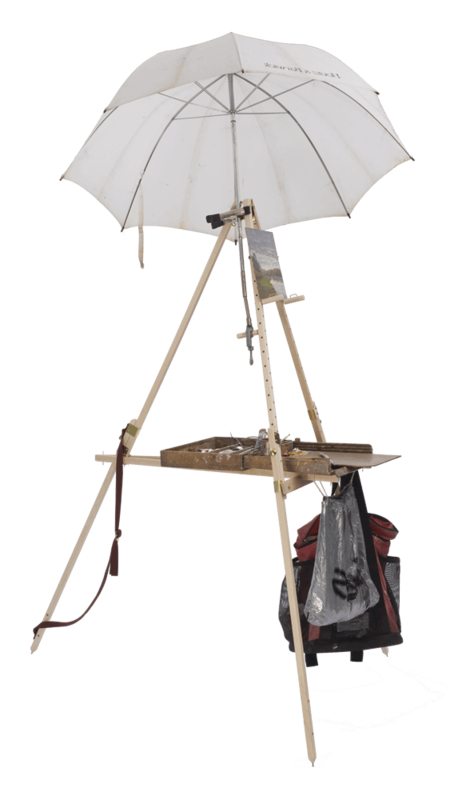 The only plein air easel you need. “I have been using this easel for 2 years now and I haven’t looked back! It is sturdy, lightweight, easy to set up and I have no size limitations on my paintings." Take It Easel's flawless performance allows you to focus on your artwork. Set-up and breakdown takes less than a minute, giving you more time to create your next masterpiece. Extremely stable in windy conditions. 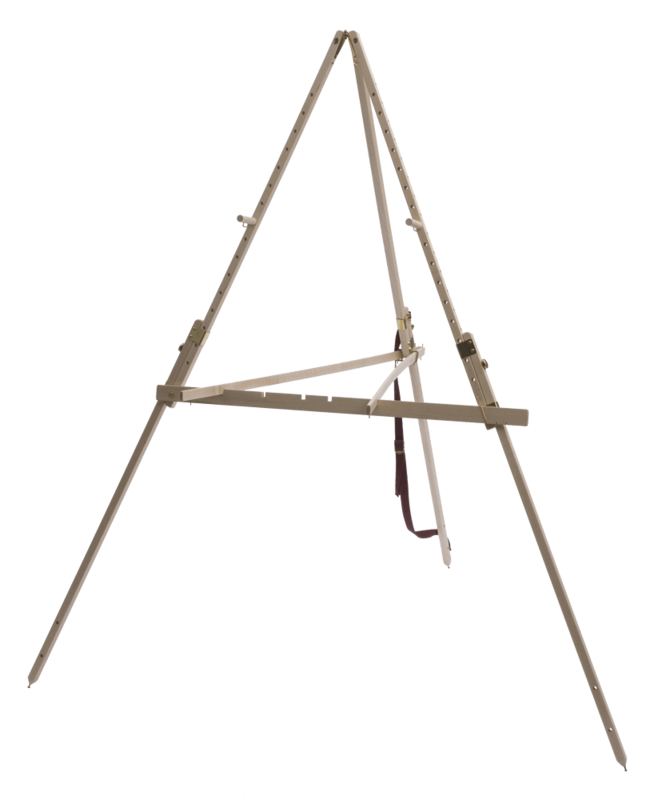 Take It Easel is the most stable plein air easel available: the fully-adjustable tripod legs span up to four feet. The legs are engineered so they can NEVER slip...so you don’t have to worry about picking your artwork and supplies out of the mud. Yet capable of supporting small and large canvases, and your supplies. 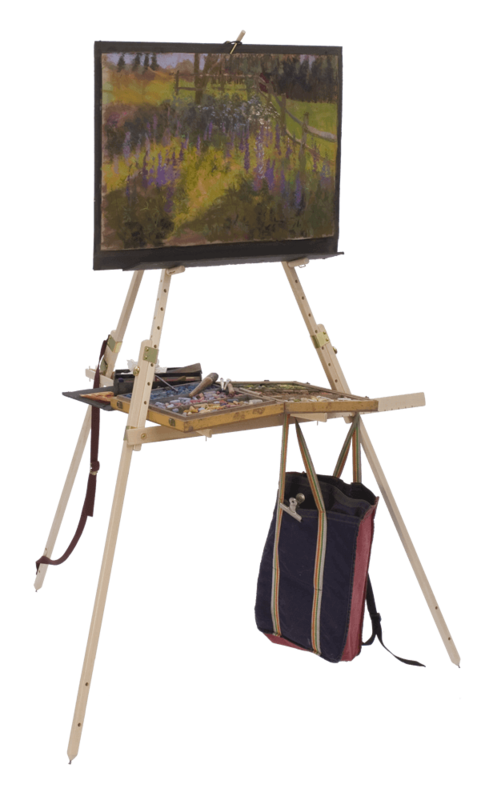 While compact and lightweight, Take It Easel accommodates artwork as small as 4”x6”, as large as 50” tall, and even wider...for the intrepid artist. You'll love having your hands-free. Take It Easel's attached shoulder strap enables you to carry your other important supplies...like your coffee. Easily attach an umbrella to your Take It Easel. An umbrella can be clamped to the extra Artwork Support Peg to shade you and your artwork. Individually constructed from North American hard maple. Take It Easel is the only plein air easel with a versatile design that supports the supplies of many mediums at an accessible working height while you are standing or sitting. featured on the WCAX Made In Vermont series! Subscribe to be notified of news and deals. Shipping at Take It Easel has always been FREE on purchases and returns within the continental United States! Due to popular demand, we're now offering free shipping to Canada and the United Kingdom as well! International duties/taxes and international returns will be at buyer’s expense. We usually ship your Take It Easel within 24-48 hours of your order, via UPS or USPS. Shipping time within the US varies from one day to one week depending on location, and international shipping can vary from a few days to two weeks or longer depending on your location and time required for customs. If you have delivery time constraints, please let us know and we'll do our best to accommodate! Though we have only had a couple of easels returned since we began building our Take-It-Easel more than 20 years ago, we will gladly accept a return of your easel, no questions asked, and we will refund your full purchase price; we'll even pay for return shipping (continental US only). Simply contact us via phone or Email within 30 calendar days of your purchase, and let us know that you wish to return your Take It Easel, in original condition and packaging. We'll provide you with a prepaid UPS label (continental US only), and issue you a prompt refund as soon as we receive your easel and make sure it's in original condition! We FULLY GUARANTEE all materials and workmanship. 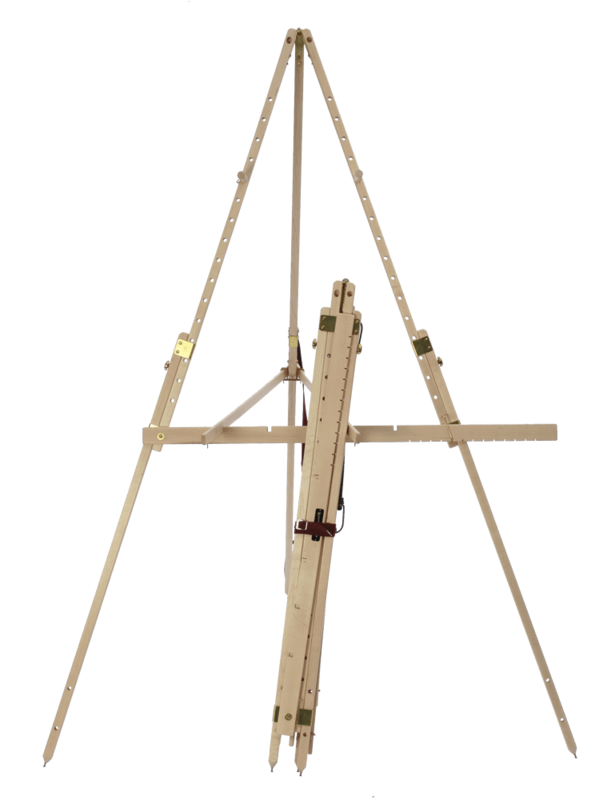 While it is very rare to experience functional or material problems with your Take-It-Easel, they are made from natural materials, and may at some point require a repair or tune-up. We promptly handle repairs on a common sense case-by-case basis, and we only charge for repairs when we feel it's due to user error. We never charge for repairs due to material or manufacturing defects. Simply email or call for our shipping address and to let us know that your easel is on the way! We bet you'll love to use these art supplies with your Take It Easel! Coming soon…a list of supplies that we recommend to compliment your Take It Easel! Your personal information is secure. Spread the word and get paid! What is an affiliate program? An affiliate program rewards you for sending business our way! Simply put, you put a link to our website on your website, blog, etc, and if someone clicks your link and then buys a Take It Easel, you make some dough. We're putting the finishing touches on our affiliate program, so please email us for more details! If you have a question, we're always a jingle away. I build the easels, ship the easels, tune-up the easels, answer the phone, and send the emails…so you've come to the right place! While I'm striving to make my FAQ complete enough to answer all of your questions, I understand that your relationship with your easel is a unique and personal one, and you might have some questions I haven't adequately addressed…so you're always welcome to contact me via phone or email with any questions!